What better beginning to your pilgrimage than the town of Vezelay, starting point of the Vézelay Way, and its rich heritage. This will be your first stop at experiencing the uniqueness of the Camino de Santiago in France. 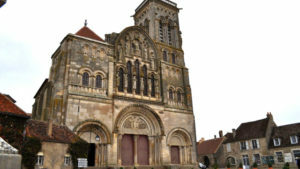 The Basilica of Saint Mary Magdelene is the largest Romanesque church in France built in 860 AD, and it was an important stop during the Second and Third Crusades. The Basilica had been destroyed once but rebuilt in the early 11th century. It has lived many wars and invasions such the Norman invasion, the Wars of Religion and the French Revolution, all leaving their imprint and mark on the building. Later on your journey, on the section 3 of the Vézelay Way, you will be walking in the Dordogne region, where you will encounter the fabulous Cathedral of Saint Font in Perigueux. A Cathedral built in the 12th century, on the ruins of the abbey burnt down in 1120. The cathedral has a very rare and unique mix of Romanesque and Byzantine architecture, making it very special. It has also been restored many times especially after the damage left by the Hundred Yeas War (1337-1453) and the Wars of Religion (1575-1577). On section 2 of the Vézelay Way, you will find yourself in lovely Bourges where you can visit the Cathedral of St Etienne, built in the late 12th century. It is a striking masterpiece of Gothic art in medieval France. Some of the spectacular stained glass dates back to the 12th century also and depict images of the life of St James. Also, along section 4 of the Vézelay Way, you will stop at Saint-Jean-Baptiste Cathedral in Bazas like many other pilgrims before you. This is said to be a compulsory stop on the Vezelay Way for pilgrims coming from Poland. Originally built in the 5th century, on the site of the original wood oratory dedicated to Saint-Jean-Baptiste, it was extended in the 12th century to become a cathedral. As many other monuments along the way, the cathedral has been witness to the Wars of Religion and the French Revolution, both leaving their mark. Finally, you will end your pilgrimage visiting the richness of Saint-Sever and its abbey, an exceptional historic example of Romanesque art and architecture despite having been damaged by wars and being restored many times. The simply remarkable seven apses, the 150 capitals and its massive size make Saint-Sever Abbey such an outstanding monument.